All photos by J. Jordan Bruns. Today it was the typical brutal day as we unloaded and started setting up at Context Art Miami in Wynwood. After trolling around for a while looking for a parking spot, we found a Doris Day parking spot nearby the loading docks for the fair (a Doris Day parking spot is like in the movies, where the main actor always finds a parking spot right in front of wherever he/she is going). The place was a beehive of workers delivering crates, European gallerists walking back and forth barking worried orders on their cell phones, cleaning crews on a constant battle to keep the place clean, Haitian day workers hanging around hoping for a job, security checking badges and asking for wrist bands, and the savage art sounds of hammers banging and drills drilling and the random and heartbreaking sound of glass breaking somewhere. Hundreds of trips later we had taken most of the art out of the van with only one casualty - this is the brutal part of driving your work down instead of having it shipped and delivered to your booth. Ran into the DMV's Andrea Pollan and then Calder Brannock; both are working the fairs. After a ten hour day we are 90% done... all the work for opening night is hung, and almost all labeled; all the electronics are working, and Simon Monk, Dulce Pinzon and me are on the walls and Audrey Wilson and Elissa Farrow-Savos are on the floor. The VIP Preview is tomorrow. The fair opens on Wednesday. In typical Floridian puzzle-weather, it was very rainy up in Hollywood Beach, which is where we are staying as we have for the last few years. A few blocks south, the sun was bright and fully ready to endorse the VIP opening at Context Art Miami. Once we got to Wynwood, we dropped off a piece for a special exhibit that the Art Miami folks had arranged with the local Marriott hotel. It was a delicate dance of driving in the serpentine challenges presented by Maimi drivers, but we installed the piece (a wonderful sculpture by Elissa Farrow-Savos) and headed back to Wynwood. We finished off labeling the work, which brings to mind the interesting tidbit that just a handful of years ago, one seldom saw any labels at art shows or art fairs. It was as if all curators and gallerists in the upper artsmosphere of the art world that made a decision to endorse David Parnas' information hiding principle. Today, it is the opposite, as delivering as much information about the work seems to be the trend. We've always used labels... just sayin'. I rushed through the fair to try to get a flavor for the quality of this year's Context... and my report is that new director Julian Navarro has done a spectacular job: this is by far the best art fair that we've ever been honored to be part of; Context has set new standards this year... more on that later. There were long lines waiting for the 5:30 opening at both Context Art Miami and Art Miami, as I was very impressed how the crowds increased as the evening progressed. The Wynwood district where several of the art fairs are staged is a pretty congested area without the art fairs and unless you are savvy enough to dance the traffic dance, it can be challenging on the night when everyone wants to go to the art show. 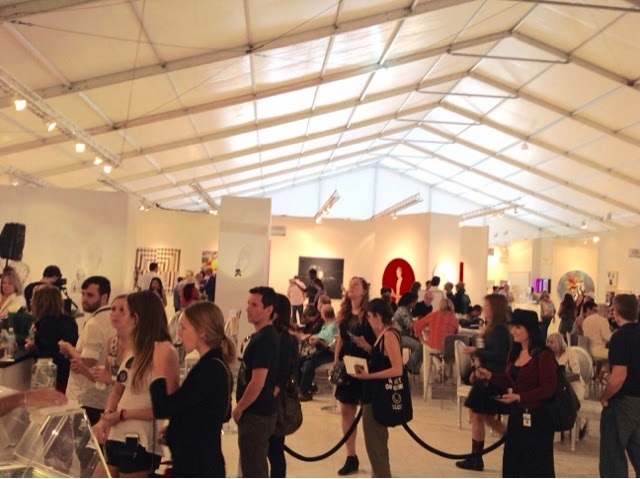 In addition to the two best-known Art Miami fairs, there are several satellite fairs in Wynwood which now use Art Miami as the magnet fair, just as all satellite fairs use Art Basel Miami Beach as the magnet fair. 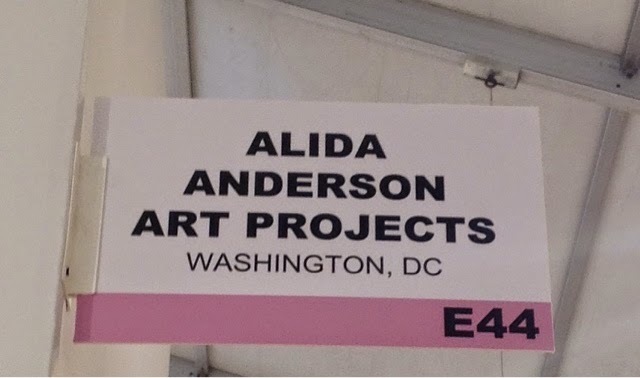 Almost immediately DMV artist Audrey Wilson broke the ice and at the same time proved my point about the importance of art fairs for artists. Wilson sold a major piece to a collector who has now bought one of her pieces at Context Art Miami 2013, Wynwood Art Fair 2014 and now Context Art Miami 2014. He also bought one of my drawings, which was nice. It is always good to break the ice on opening night... as the night ended I sold three more of my pieces. Overall I noticed that all the dealers around us seemed to be making sales, and this is a great indication of the hard work that it takes to get a critical number of collectors to an art event. Tomorrow the fair opens to the public. 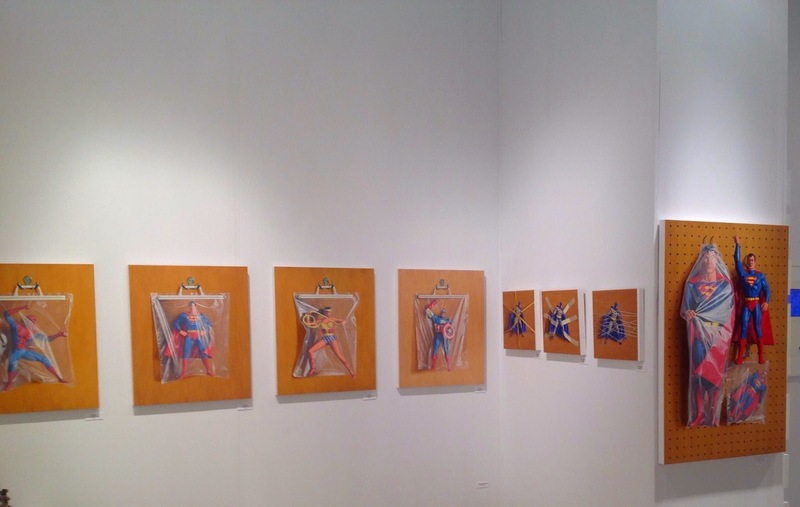 Today was the opening to the general public of the Context Art Miami fair. We arrived a few minutes after the official opening time of 11AM, as did most other dealers (we saw the hardworking Leigh Conner hustling to Art Miami). This is the result of trying to get off the highway to North Miami Avenue... this simple operation seems to be a permanent parking lot at practically any time. Plan for about 15-20 minutes to get from the highway to the fair; traffic is that bad! Today was a much calmer and slower day than yesterday, with noticeably less young women, slim as rifles (and just as dangerous) confidently walking the aisles of the fair on needle heels and unshaven young studs with shiny hair, otherwise clean as a new stiletto, taking phone pictures of the artwork. The day went fast, with the only novelty being the arrival of a couple of well-known DMV artists, Tim Tate and J.T. Kirkland, as well as a local guerrilla artist paddling his artwork ($20 a painting) while streaking through the fair. The sky fell yesterday, or at least it sounded that way when it started to rain hard, really hard and one is inside one of those gigantic tents where most ABMB art fairs are held. Tents, regardless of size, always leak, so today was an interesting day in the life of a gallerist, as we scrambled to prevent art from getting wet. The City Paper's Christina Cauterucci and Perry Stein were over in Miami Beach and delivered an outstanding report on DMV area galleries and artists at Aqua Art Miami, although somehow they missed the three DC artists being exhibited by Mayer Fine Art. Read their Aqua report here and their final report here. All three of these artists, Judith Peck, Victoria Gaitan and Jeannette Herrera, have been showing in Miami for ABMB for the last few years. Friday was packed with people at Context Art Miami, and today I really saw some dealers move art off the walls - most noticeably our neighbor across the hall, a gallery from Colombia who was doing well with some gorgeous work by Colombian artists. 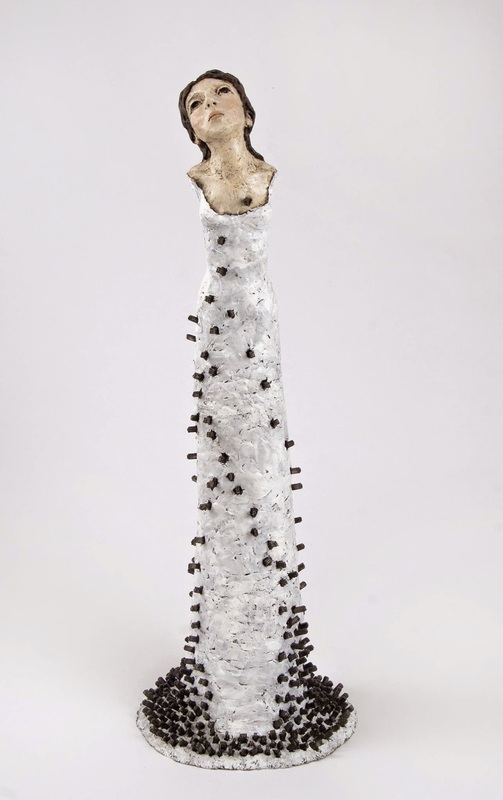 We also had our best day so far, selling a nice sculpture by Elissa Farrow-Savos and a very large drawing of mine. Around seven PM, the sounds of helicopters overhead were quite loud, and a little checking revealed that street protesters (some protesting the sad Eric Gardner issue, and others the death a year ago of a local graffitist who died after being tasered by the police) around Wynwood and eventually shut down I-95. Needless to say this caused the area's usual gridlock to become gridlockier. With the aid of some dexterous driving and Google maps we drove through Little Haiti and picked up I-95 north of the closed part and managed to get to our Hollywood hotel with little loss of time. Saturday was so far the best day at Context Art Miami. In fact, in the eight years that I have been doing art fairs, this was the best one day ever. The day started early, as we shifted home base from the beach hotel in Hollywood Beach to Little Havana, in order to be closer to Wynwood for the crucial last two days of the fair. After dropping the luggage and getting two "colados" to kick start the sleepy systems, and on the way to the fair, a phone call resulted in the sale of six of Dulce Pinzon's amazing work; that's the way to start the day. The crowds at Context were huge; it was actually hard to navigate the halls! We sold work by Simon Monk, multiple pieces by Elissa Farrow-Savos, and several of my drawings, including a major video drawing. It was frenetic selling, with multiple trips to the gallery van to replenish the walls. We also noticed that the dealers around us seemed to be selling well. It is all a question of numbers: Art Miami succeeded in bringing large crowds to the fairs, and this is in direct proportion to the probability of a sale. There were also multiple "wake" events as I call them. They are the potential after-effects of doing an art fair... For example, there are at least two galleries interested in Elissa's work, and one in Audrey Wilson's work and a local Miami gallery in my work. Sunday is the last day; apparently there are more street protests scheduled, so it may get interesting. The street protests yesterday had minimal impact on the fair, and once again good crowds were present. We had another decent day, and sold eight of my drawings, as well as an acquisition of two of my vintage Art school stone lithographs by the Museo de Arte Afroamericano in Caracas, Venezuela. As we were beginning to pack a few minutes after 6pm, a couple did actually come back and purchased the work. As we began to wrap it, a very pretty collector from San Francisco also returned and was a little... Well, actually a lot, saddened to see that the sculpture had been sold. It had clearly made a powerful connection with her. I actually think that she was almost ready to make the new owners an offer for the piece and thus create a new record for the fastest secondary market art turnover in history! She appeared truly bummed out, so I gave her one of my Art School vintage stone lithos as a present and promised to see if the artist would entertain re-creating another version of the work. We were packed and out of there by 8pm, and after a heinous 4am wake up call, I now sit in the plane at oh-dark thirty as I head back to the DMV after a very successful art fair!